Yo..! Templates Presenting Gracious Blogger Template, Our Yet Another Gorgeous looking Blogger Template of 2016. Gracious Blogger Template is a clean,fully responsive and easy-to-use blogger templates, specially designed for story tellers,fashion Bloggers, Photographers,Personal Blogging, Food Bloggers and everything in between. 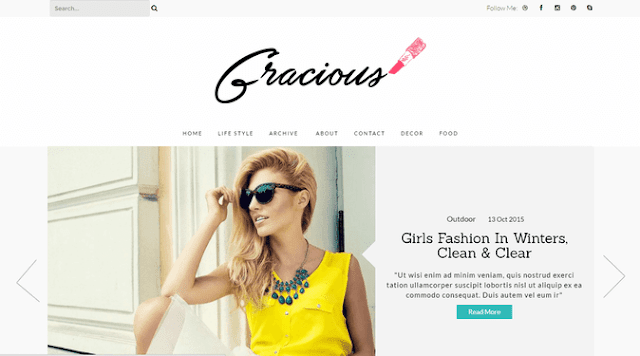 Gracious blogger template is a 100% responsive blog theme for bloggers.So it looks great on all devices. Gracious Comes with an extensive documentation containing screenshots to help you even better, So, We'll suggest you to kindly take some time to read through the documentation included in the template zip package. If you still have any problems, please feel free to ask for the assistance via our contact form. Please note, this is the only place to get support for free blogger templates. And due to the large amount of support questions,support for free blogger templates is provided only for bugs and templates related issues. The template will be available instantly Once Your Payment Process Is Completed.You will receive an email from Yo..! Templates with your download link. Download the Premium Version template, and Send us all the requirements and specification, what would you like to have in your blog. - Your social media profile links. - Name and sequence of the links do you want to have in the Menu bar. - Image to the "About me" gadget and text to display under the image. Please share your blog URL here, We will definitely help you out. When I look at the layout, it says "undefined." Also how can I make the widgets on the right line up? some have shorter widths than the other. This template is really awesome! Please help me. Much appreciated. Thank you! i will, no, I have installed bujt don´t work!! :-( I will die!! REMOVING THE CONTINUE READING TO SHOW THE COMPLETE POST ? ?